Anchorage guides and experienced sailors will tell you that you have to be well prepared for the challenges the west coast of Tasmania is likely to throw up at you. We just did not expect hauling up the anchor by hand to be one of them! March wasn’t spent as ‘efficiently’ as was planned with weather and mechanical issues playing a large part in slowing down our exploration and sightseeing. 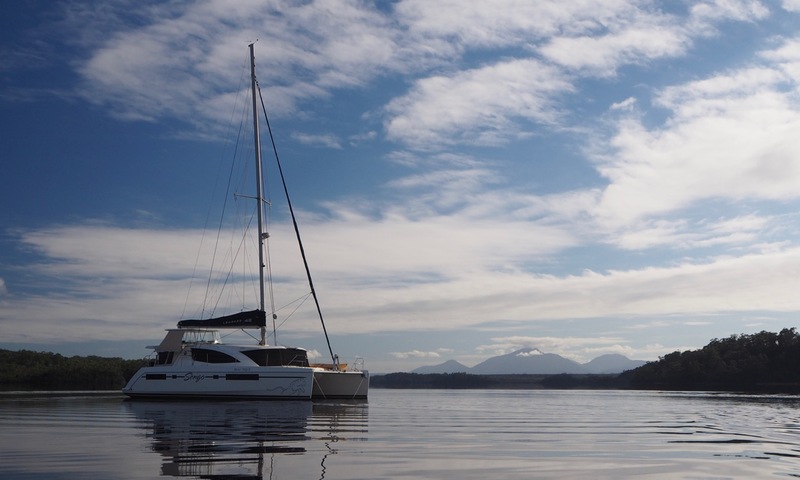 On the other hand, if we had seen all we wanted to in Macquarie Harbour and the Gordon River and had moved on to Port Davey and Bathurst Harbour and the anchor winch had packed it in there, we would have been in real trouble. So, I guess we can be thankful for small mercies – there are worse places to be stuck than Strahan. A lot of the March 2019 newsletter blurb is my description of what the weather was doing – in some cases a running thought bubble that will help me to remember the days when I reread my notes – so apologies in advance for any perceived waffle. Having only just got the base lens of my camera back at the end of February, I went a little overboard taking photographs this month, and have had to modify the photos in the newsletter down to small size (i.e. they may be fuzzy) just to get the document to a reasonable size (it is still quite large). However the best photo of the month isn’t actually mine (see page 2 – thanks MH!). Enjoy Aboard Sengo March 2019 (The file is 11.1 Meg). Nice to revisit familiar spots through your eyes. You did manage to see a fair bit of the anchorages around Macquarie Harbour, despite your woes with the anchor winch! Love your photos of the kingfishers. Hope you are on your way again by now, even if it is probably north rather than around Tassie as originally planned. Hi Chris. Apologies for the late reply, we have been out of internet range. We are fortunately able to move freely again. We havent left Macquarie Habour yet, but, yes, it will be north rather than south. OMG, we thought you had left! What happened? When the anchor winch was fixed we headed back to the Gordon River for some more exploring. It is getting colder here though… time to leave soon…. Hi Sue. Apologies for the late reply, we have been out of internet reception. You will be pleased to know that the winch is now working. Yay!! Strahan is a lovely place, and I havent met anyone who hasnt enjoyed their time here.